That’s right. 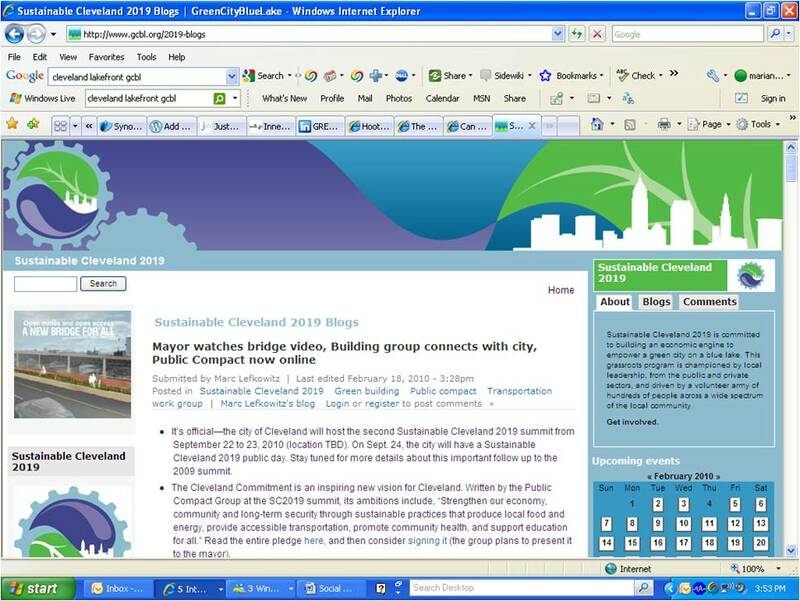 The Sustainable Cleveland 2019 Summit and related initiatives now have their own blog, and it’s currently hosted by GreenCityBlueLake. The following video by Graham Veysey summarizes the proceedings of the Sustainable Cleveland 2019 Summit hosted by Mayor Jackson. I have heard multiple Clevelanders state their frustration about the lack of visible results that have come out of the Sustainable Cleveland 2019 Summit so far. But what I say to them each time is that this is a 10 year project. And we are responsible for the results. My mom (Ruth Eppig), my boss (Margie Flynn), and my freelance employer (Terry Schwarz of the Cleveland Urban Design Collaborative) all appear in this video, which I thought was pretty cool. This was filmed by Gram Vessey, who will also be making a video of the event itself. Here is another video, filmed by Mark Rabkin on his Flip, of my boss – Margie Flynn of BrownFlynn – speaking at the Summit. Joe brings up a good point – we need to be realistic when drafting our strategic plans for the next ten years. However, this Summit was not meant to be “realistic” in the way that politicians often have to maintain boundaries, balance budgets, and keep constituents happy. This summit was about Dreaming Big and bringing down industry boundaries to create a better city together. Sustainable Cleveland 2019 was unprecedented in terms of bringing so many people from different silos together to move an entire city to become more sustainable environmentally, socially, and economically. No other city has done this, as far as I know. (If other cities have, please leave a comment and let me know – also, I’ll be looking further into this). So, I think there needs to be a stage of dreaming up big initial goals (or Big Hairy Audacious Goals – BHAGS), which is what this Summit was all about. The next stage of coming up with achievable action steps to lead up to some of those goals in the next ten years is up to us. I would argue that some of the plans of the Great Lakes Regional Collaboration fell through not because they were “unrealistic” and dreamed too big, but because they did not follow through on achievable action steps. If we want to actually realize these dreams that we have dreamed during the Sustainable Cleveland 2019 Summit, then we have to be willing to take responsibility for the sweat-equity that must take place between now and the time that we achieve our goals. No one will do it for us. I spent the last three days at the Sustainable Cleveland 2019 Summit hosted by Mayor Jackson. For us sustainability nerds, it was a high to spend half of the week with like-minded cohorts, working together to design the most sustainable future Cleveland that we can collectively imagine. We heard from Mayor Jackson, Van Jones (author of Green Collar Economy), David Cooperrider, Dr. Peter Senge of MIT, Marc Lautenback of IBM, Ray Anderson of Interface, and Holden Shannon of Continental. But perhaps most importantly, our group of leaders (from government, non-profits, for-profits, sister cities, NGOs, etc) followed the Appreciative Inquiry process to build from Cleveland’s strengths to develop prototypes and strategies for creating the sustainable Cleveland of tomorrow. Some of the prototypes that we came up with can be implemented right now. And the resounding message from the Summit was that people are willing and devoted to starting the projects that they created in their groups as soon as they can. We realized that the momentum gained at this unique gathering could not be lost with the passage of time. This is too important. The health and prosperity of our people, our environment, our economy and our city is too important to deprioritize.